There are many things I love about citizen science. Much of it boils down to a romantic image of a person standing alone in a field, looking up at the stars and discovering something new. Something that billions of other people have overlooked. Something that professionals with million-dollar equipment have overlooked. All because they had passion, patience, and access to the same sky everyone else has. Sadly this image is in jeopardy. Not the power of citizen science, but the ability to have a clear night sky every other generation has taken for granted. Light pollution from cities and towns is increasingly bright and washes out the stars we all love to gaze upon. It also threatens wildlife that navigate by the stars, and it threatens human emotional health by killing the wonder of the sky. For ten days this month, between March 13-22, the Globe at Night project is working to solve this problem. First by measuring how bad it is in certain areas, and secondly by drawing attention the public's attention to the problem. As citizen scientists who share a romantic ideal of keeping the skies dark and clear for everyone, won't you help them? Visit Globe at Night to learn more about the problems of light pollution and ways we can increase public awareness of the program. Wait until it get's really dark outside and the sun is no longer providing any light to the sky. 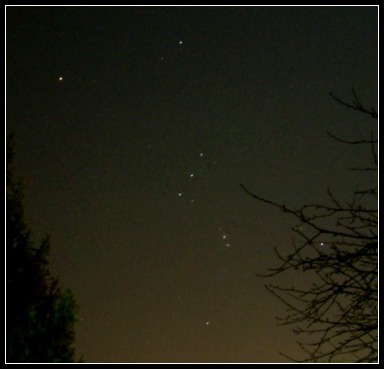 Find Orion. It's most identifiable by the string of three bright stars in a line that indicate his belt. If you aren't sure, look for a free star chart online, download the Star Walk application (or similar app) to your mobile phone, or watch this video for help. Determine the magnitude of stars visible in your area. For help, compare the sky to these online magnitude charts. If you aren't sure exactly how to use them, read through all the instructions and take this practice quiz until you are comfortable making these observations. Once you ahve all this information visit the data reporting page to make it official. Find your location on the map provided, estimate how many clouds were in the sky (a guide is provided), and report the magnitude of stars that were visible. Wasn't that simple? Of course you can go the extra mile and help promote the Globe at Night campaign with marketing materials from their site. Tell your friends, your neighbors, or your classmates. In the last few days over 6,000 data points have already been reported. Let's add yours to the list too.